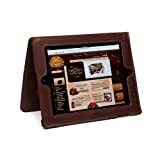 Zoomba iPad 2 smart cover polyurethane leather case stand. Perfect fit for all ports and camera accessible. 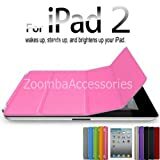 The Zoomba iPad 3 case provides wake up and sleep function as Genuine iPad 2 smart cover does. 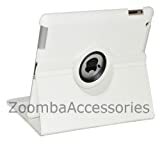 Zoomba iPad 3 smart cover polyurethane leather case rotating stand. Perfect fit for all ports and camera accessible. The iPad 3 rotating case provides 360 degree rotation and multiple angel views with 3 slots to hold iPad 3. The Zoomba iPad 3 case provides wake up and sleep function as iPad 3 smart cover does. The Riser is compatible with the iPad 2 and iPad 3. 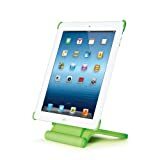 The Riser iPad Stand can elevate the iPad 4″ closer to eye level and has an incline range of 90 degrees that goes from completely lay-flat to absolutely vertical. And the Riser can rotate your iPad 360 degrees switching easily from landscape to portrait and back again. Can also be used as a Digital Picture Frame. Our iPad case (iPad 2 / iPad 3) was designed with thick full-grain leather and outward facing seams. This makes for a very tough and impact-absorbing case. The straps can be folded back through the loops so you can prop the case up vertically or horizontally for all your watching, surfing and typing. This case will outlast 30 iPads.